A USB flash drive is an essential gizmo and just about everyone should own at least one. 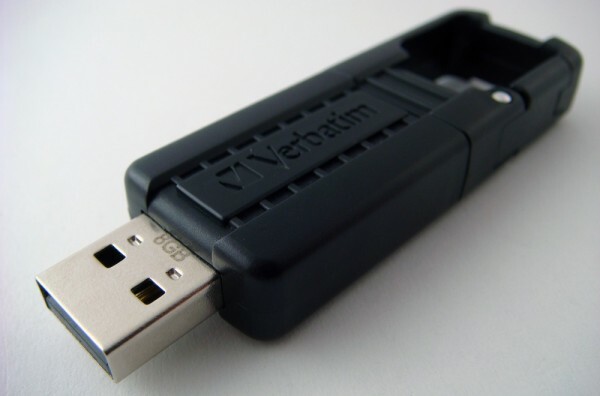 Flash Drives come in millions of varieties including truly ultra-portable ones such as the Super Talent Pico or with high-grade security such as the IronKey. The Verbatim Tuff Clip on the other hand has a more traditional form factor, but it’s aimed for those with an active lifestyle with an added clip. This flash drive looks and feels different from a conventional USB flash drive. Both sides of the Tuff Clip feature ridges along the body for a better grip. The USB connector recedes into the body for protection. While it may seem like a neat idea, it turned out to be quite annoying. If you weren’t holding both the back portion and front portion of the drive when inserting into a computer, the connector kept sliding back into the chassis. this issue could have easily been avoided with a simple click and lock feature when extended. Moving forwards, there’s a clip on top that fastens onto a backpack, belt loop, or ring. The spring-loaded clip automatically snaps closed once fastened onto something. 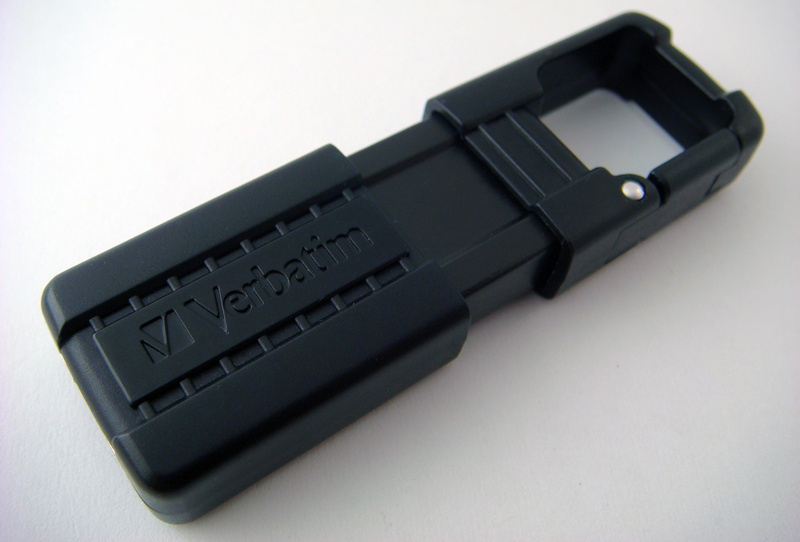 Verbatim describes the Tuff Clip as a “clip n’ carry” with a “rugged design”. While I would agree with the first statement, the Tuff Clip is definitely not rugged. When I read about this model, I expected it to offer the strength of the clip to be comparable to an average carabiner. I was quite wrong. The clip looks like it’s flimsy enough to break off if it becomes snagged on something. A blue LED indicator lights up on the face of the flash drive when in use. File transfers to and from the flash drive were about average for a flash drive in this price range. In comparision to other flash drives we’ve reviewed, the IronKey was faster in both read and write, but only the read speed on SanDisk Cruzer happened to be faster. The benchmark results showed that the average speed was around 25 MB/s with an access time a notch slower than comparable models. However, real life speeds were slower and jumped around at times. On average, it took just less than a minute to transfer a 700.1 MB movie file at a speed of 15 MB/s to the flash drive. The read speeds were faster than write speeds as expected, but was still slower than other flash drives. The read speeds clocked in at an average of 17 MB/s taking about 40 seconds to copy the file back to my computer. 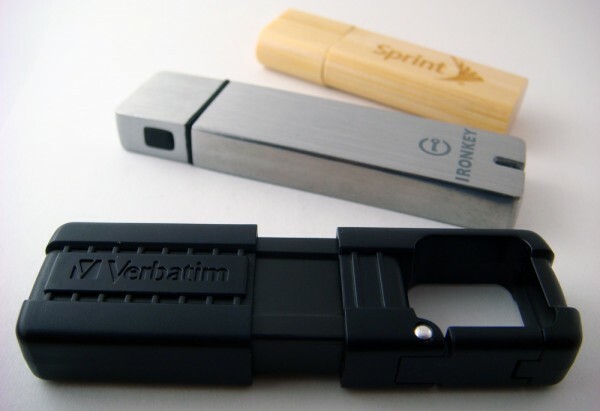 The flash drive we reviewed was the 8GB model, but it’s also available in a 4GB capacity. The drive is fast enough to be compatible with the Windows ReadyBoost feature for increasing system performance. I personally didn’t notice any changes on my PC with ReadyBoost, but it’s not going to help much if you have 4GB of RAM. There’s also a security feature that lets you set a password for the flash drive, but it’s probably more of a gimick. Devices such as the IronKey offer real hardware encryption to prevent unwanted eyes from viewing your files. I wasn’t too satisfied with the Tuff Clip. While it featured an innovative slider and clip on the top, it was simply too flimsy. The transfer speeds could definitely be improved, but they weren’t terrible either. While it’s targeted at those with an active outdoor lifestyle, I definitely wouldn’t recommend this. If you plan on taking this hiking, it’s probably going to fall off before you know it. I feel the build quality makes the drive more susceptible to damage than standard flash drives. Although the clip makes placing the flash drive on backpacks and rings and such convenient, I would highly suggest getting a more traditional model and just storing it inside a pouch or backpack pocket. This clip will snap off in no time. Even though the slider should cover and protect the USB connector, it fails to lock into place. There’s just too many issues with this drive for me to recommend it. If you really need a clip and can’t find an alternative solution, then consider this. However for the rest of you folks, I’d suggest sticking with a simpler and more affordable flash drive. It’s a creative idea, but has poor execution. It needs to go back to the drawing board.